Sea sapphires are flashy planktonic crustaceans that appear and disappear. No one knew how they did it – until now. In Gorontalo waters on certain days, divers are ready to descend. They notice tiny flashes of color in the water column. The flashes look like chips of iridescent blue paint. Sometimes the color is yellow. Occasionally, it is golden red. Upon closer inspection, those tiny ovals of blue are plankton floating in the water. Approach one with your finger. It will swim away and disappear. They are commonly called sea sapphires. 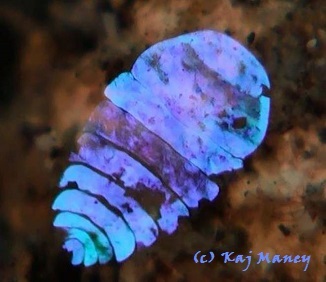 These brilliant and mysterious creatures are actually sapphirinid copepods. 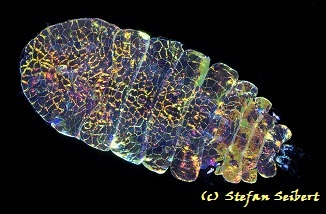 Copepods are a subclass of tiny crustaceans. They have elongated bodies and forked tails. Their scientific names reflect their jewel-like appearance. Only male sea sapphires flash brilliant colors. They are carried by ocean currents, along with other planktonic life, to the coral walls of Gorontalo. Sea sapphires are an important part of the food chain. When we see them collecting off a dive site, we look out for whale sharks. Female sea sapphires do not float the oceans with the free-swimming males. Instead, they congregate inside certain kinds of transparent jellys. Females have much larger eyes than males. Perhaps this allows them to scan the vast ocean for flashy boyfriends. Watch them in incredible Kaj Maney’s video. A team of scientists from the Weizmann Institute of Science just discovered how male sea sapphires appear and disappear. Their study was published in June 2015. Males have alternating layers of hexagonal-shaped crystals. These are imbedded in their backs. Sea sapphires are only a few millimeters in length. But researchers managed to measure the distance between those reflective crystals found in sea sapphires. They used live males. The distance between crystals was only about 1/10000 mm. This measure is about the same as a wavelength of blue light. When sunlight hits male sea sapphires, only one color is reflected by the crystals. Usually, it is blue. Differences in color depend on the distance those layers of crystals are from one another. That is why some sea sapphires appear yellow or golden. This type of coloration is called structural coloration. Male sea sapphires swim freely in the open ocean. However, they do not swim in straight lines. They swim in spirals. Researchers also discovered how these sea sapphires disappear so quickly. As they turn, the angle of reflected light changes. When light hits them at a 45-degree angle, the reflection shifts out of the visible light range. Only ultraviolet light is reflected. Since humans cannot see ultraviolet light, male sea sapphires seem to disappear. They do this by merely turning their bodies. Although how they appear and disappear is now known, no one knows why.